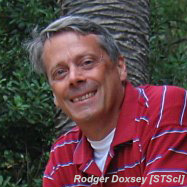 The Rodger Doxsey Travel Prize — established through the support of his father, John Doxsey, and other friends, family, and colleagues — provides graduate students or postdocs within one year of receiving or receipt of their PhD a monetary prize to enable the oral presentation of their dissertation research at a winter meeting of the AAS. (Because nearly all dissertation talks are given at winter meetings and hardly any at summer meetings, the Doxsey Prize is awarded only for winter meetings.) The first awards were made for the 217th AAS meeting in Seattle, Washington, in January 2011. Applicants must be planning to present their dissertation research at a winter/January AAS meeting in the form of an oral dissertation talk; poster presenters and those giving regular, special session, invited, or other types of oral presentations may not apply for this prize. Applicants' dissertation research must be in astronomy or a closely related discipline. Participants must indicate during the abstract-submission process that they want their dissertation talk abstract to be considered for the Doxsey Travel Prize. Applicants must be attending a North American university or have recently graduated from a North American university. Doxsey prize entrants must be members in good standing of the AAS. Only oral dissertation talk abstracts submitted by the on-time abstract deadline are eligible for judging. Late abstracts are ineligible. Advisors of the applicants must submit a letter indicating that the applicant is within one year of receiving or receipt of the PhD. These letters will be shared with the selection committee. The number of awards and size of each award will vary each year based on the amount of available funds, but the goal is to provide enough funding to cover a significant fraction of the expense for traveling to and attending a winter AAS meeting for 10% of the dissertation presenters at the meeting in question. The award will be made in the form of a check to the recipient and a waiver of the registration fee for the meeting in question. The prize money is a travel stipend and may be used only to pay for meeting-related travel expenses (e.g., transportation, lodging, and meals). In addition to naming winners, the judges may elect to name runners-up who will receive complimentary meeting registration but no travel stipend. If you have an AAS online account, please click here to make a donation to the Rodger Doxsey Travel Prize fund. If you are not an AAS member, please send a check and cover letter directly to the American Astronomical Society, 1667 K Street NW, Suite 800, Washington, DC 20006. All donations are tax deductible, and you will receive a donation letter recognizing your contribution by 1 February of the year following receipt of your contribution. The deadline for entering an oral dissertation talk in the Doxsey Travel Prize competition is the same as the meeting's on-time abstract deadline, which is usually around 1 October for winter meetings (check the appropriate meeting page); late abstracts are not eligible. There is no Doxsey Travel Prize competition at summer meetings. Applicants for this prize must indicate they would like to be considered during the dissertation talk abstract submission process. Please visit the submission site for the winter meeting at which you intend to present. Once you have submitted your abstract, you are required to complete the Roger Doxsey Travel Prize Sign-Up Form.